Hi everyone, this is Mona with another fun journal page. 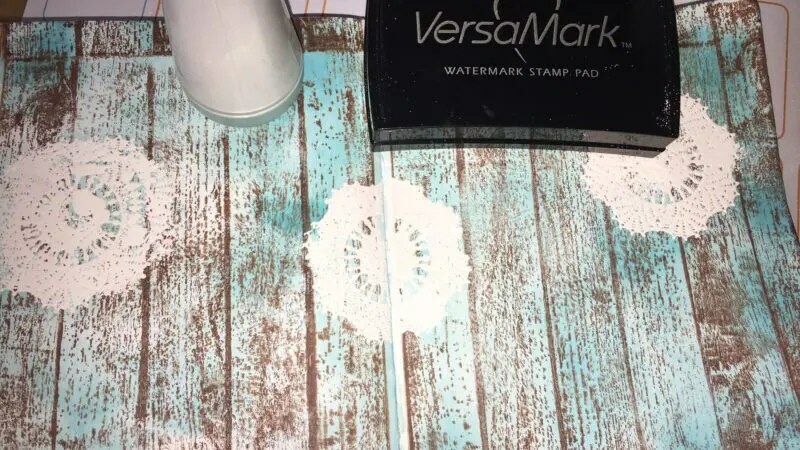 I hope you enjoy this mini tutorial featuring the Dream Catcher Stamp set by Mudra and most of my supplies from my favourite store Kat Scrappiness. I started by using my Dylusions Art Journal that can be purchased at Kat Scrappiness and added gesso to both pages. 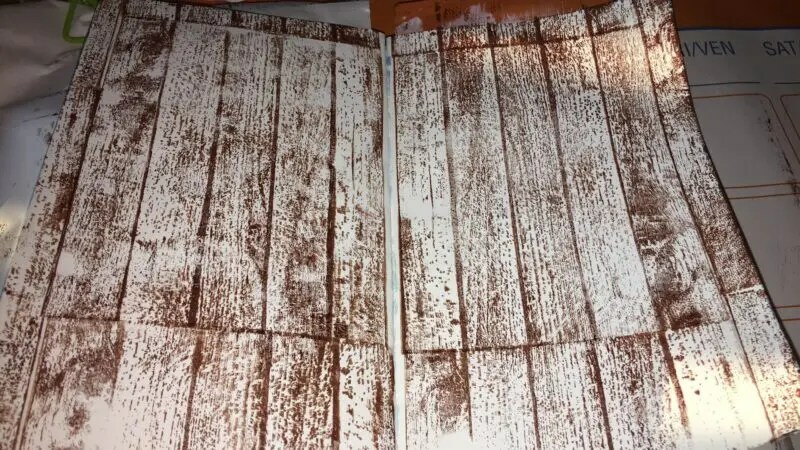 After it was dry I used my brown Archival ink pad my wood plank background stamp and added it all over both pages ,carefully aligning it to keep the planks lined up. 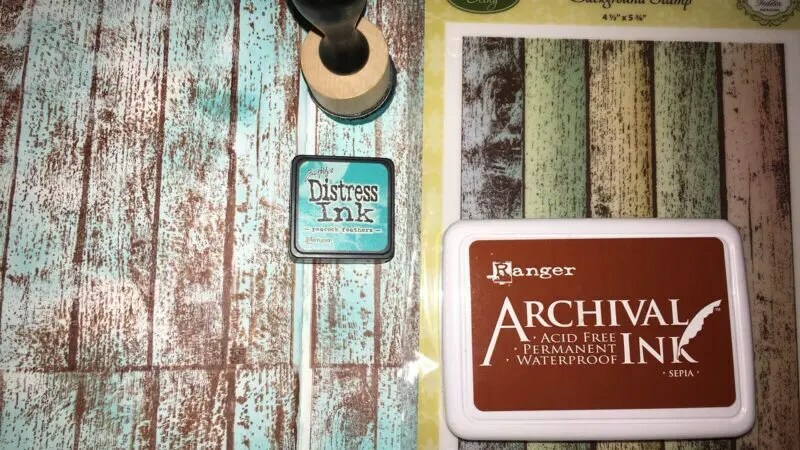 Once my brown ink was dry I used Blue Lagoon Distress Ink, along with my mini distress tool from Ranger to add a bit of colour to my background. 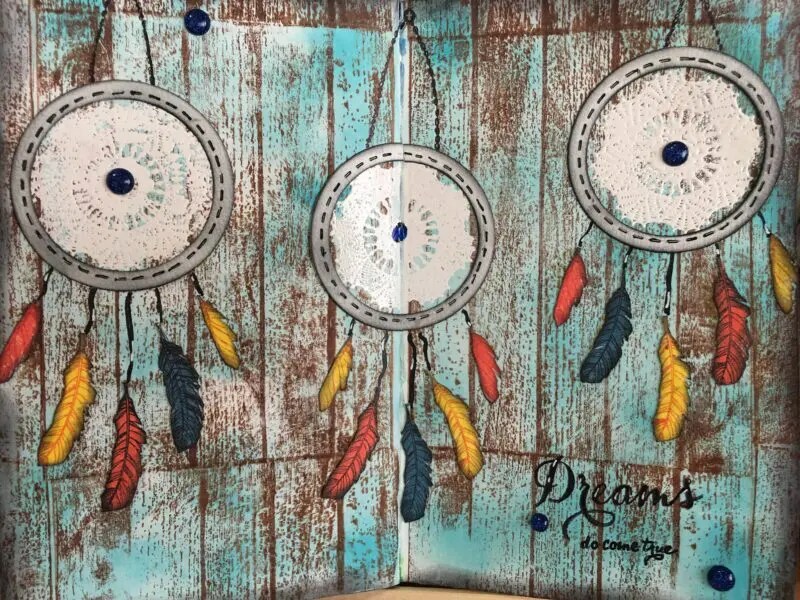 Now that the background is finished, I stamped the middle part of the dream catcher with VersaMark Embossing Ink and then added Wow White Embossing Powder . 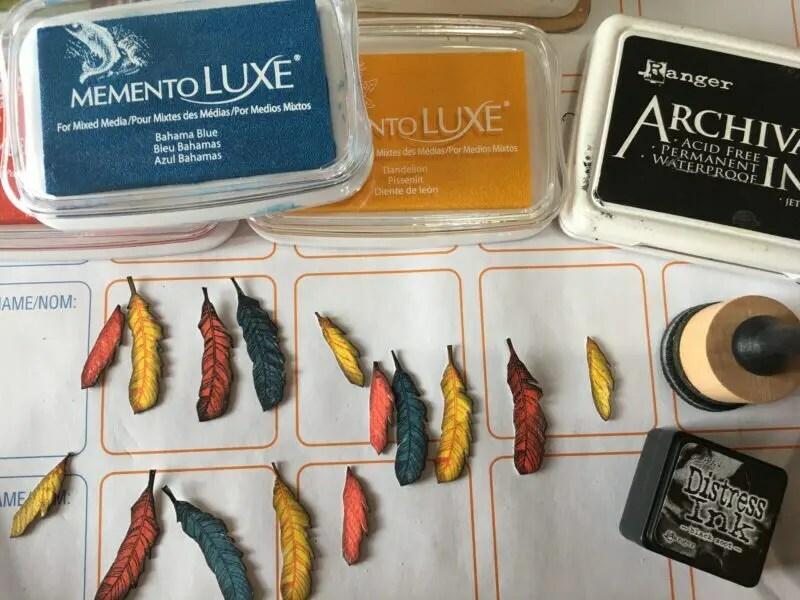 I used my heat tool to melt the embossing powder and make it really nice and bright. I embossed three of those to fill up my pages. Next I used two circles from my stitched circle dies and lined them up so I could make a ring. 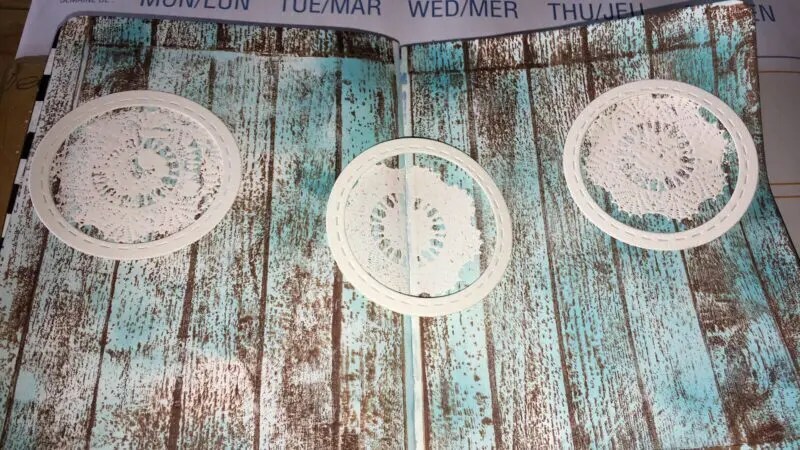 I die cut three of the rings and glued them around the embossed inner part of the dream catcher using the Nuvo Adhesive Pen. Now for the fun part! 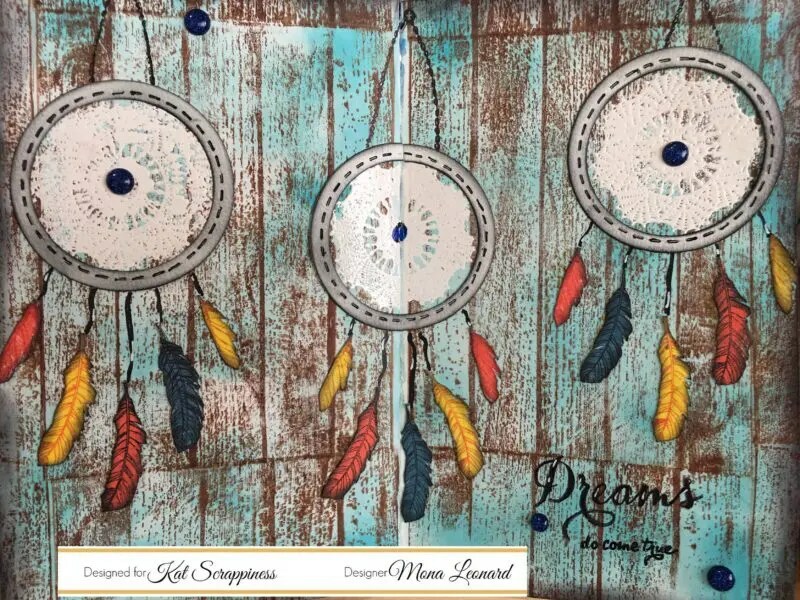 I stamped a bunch of feathers from Dream Catcher Stamp Set by Mudra, using different ink colours to make them nice and bright. Each leaf is made with a two step stamp where I used the lighter colour first and darkest on top. I also used my blending tool to add a bit of black soot distress ink around the feathers. For the finishing touches I adhered my feathers, again using the Nuvo Adhesive Pen. I used a black marker to make the lines that hold the feathers and the pretend chain holding the dream catchers. I also traced the stitched lines with my marker and stamped the sentiment from the same stamp set using Ranger Jet Black Archival Ink. I added a few dark blue enamel dots to finish off my journal page. Hope you enjoyed this tutorial, see you soon. Great page, Mona! Love the colors you chose.